Hurricane Watches are up from Florida City (in extreme south mainland Florida) to Flagler Beach (Including Lake Okechobee)-- Topical Storm watch for the northern Keys. This means that hurricane conditions may be felt within 36 hours. A hurricane Warning may be issued sometime tomorrow for a more specific area. Hurricane Warnings are up for all of the Bahama Islands as well. The hurricane is still a strong category four storm, and the forecast track of Frances remains similar to the last track. If I would pick a model based on performance, it would be the NOGAPS. However, confidence is still not where I'd like it. Again, the track remains mostly the same as the previous one... the hint in the 11PM NHC Discussion is that it may go more west. Mainly because of the high altitude Gulf Stream IV Jet's contributions to model initializations. The discussion is a good read this evening. It is not good for Florida. Follow local instructions from media and officials in your area if affected, you may also want to view the popup advisory main page to see local storm statements. It may take some time for the statements to propigate. Local county by county information will no longer be updated unles there is breaking news here. Use the links in the last article to view county emergency management webpages. Florida Disaster.org is the state em page, with links to locals as well. I have been at work all day and have read all the posts and listened to a lot of rumors from people who may or may not know what is going on. Please explain where the consensus of landfall is expected to be and where it will be if it goes right or left. Central Florida, and specifically Polk County, tends to get ignored from both of the Media coming from Tampa Bay and Orlando. We have been protected in the past some what but the rumors are flying about our vulnerability this time. Please anyone who has any knowledge please comment. When the discussion uses words such as "disturbing", you've got to be concerned. When will new model runs come out? Read the NHC advisories and discussions, Stacy Stewart's discussion is carefully crafted as always and hits the nail on the head. They don't know. I put up all of the hurricane panels this evening...sigh, for the second time in three weeks. Never thought that would happen. This time I am leaving them up for awhile...don't care if the home owner's assoc. says anything! I live on Merritt Island between Melbourne and Cocoa Beach. We live at one of the highest points on the island would take a strong Cat 5 to flood us, and the house was just built to very strong standards and we have Cat 5 rated panels. We are planning to stay unless the eye is to pass very near. The way I see it...the entire east coast of FL is going to be on the roads. I would rather be in my strongly constructed house than stuck on the road...(when we left for Floyd it took 8 hours to go 40 miles to Orlando. And for all we know maybe Orlando will be hit worse than us. Guess I just need to wait to see what the track shows tomorrow night to make the final decision. WHAT DO YOU THINK JASON? how did the bad data in early models get in? could there be a more west track possible by 2? **the NOGAPS been pretty on? That is provided she slows down,with the ridge stronger than anticipated she continues WNW at a decent clip.I believe this is the reasoning for the watches 36hrs.I mention this last nite in the forum that at 15mph on her course it is a S FL event in 60hrs. 24hrs have passed. what the guy says usually carries more weight, because he EXPLAINS the forecast reasoning, not just an issuance of statements. first convincing argument i've heard from the NHC for the central florida track they've been pointing to for the last day or two. with the explanation of why the half of the forecast models i was betting on are possibly in error.. my track confidence (to georgia) is down quite a bit. going down with the ship, as far as that goes.. a lot less to wreck in coastal ga though, it is perhaps the best of options. my earlier comments notwithstanding, if i was on the florida coast from west palm to st. augustine, i would be ready to evacuate by tomorrow afternoon. everybody out of the pool. if the storm does make a gulf appearance (even a brief one in apalachee bay) the damage swath will be extended quite a bit, though i doubt the gulf side of florida would get near the hurt the atlantic side would. the eye symmetry is improving, and as stewart mentioned the lower humidity environment that may have been checking Frances is becoming a thing of the past. expect the storm to deepen overnight, 8-12mb or so. elsewhere, 97L did get tagged a 1.0, and it's convection is still refiring with vigor.. it has been an unclassified depression, perhaps NHC will take the plunge if it can get out of the high shear environment somewhat intact. most globals recurving it, but i'm entertaining the idea of a mostly westward track. 98L may develop more quickly than 97L. deep convection is maintaining with this feature. global runs tending to take it to the caribbean.. or at least close. weak disturbance near the nc coast may be the one caveat that can right-bias Frances. not holding my breath, and not wishcasting it, but i'm not one to ignore possibilities, even remote ones. synopsis.. Frances crow may be appearing on my menu for friday.. likely another storm or two by early next week.. and a very dangerous situation for florida, if it comes to pass, inside 72 hours. H2Ocean, I don't think that I would wait that long. Unless you have provisions for a week stored up. Last time I checked your area had the highest probability of the center passing within 65 miles. Ft Myers and Venice were in this same boat with Charley. They consistantly carried higher probs than Tampa. Don't wait too late. You can rebuild, if you have to. >>> Lil Phil, Not to be rude or anything as you are much older and wiser then me but I dont agree with you saying the Gulf isnt a possibility for a second landfall. You guys are placing WAY too much faith in little ol' me. Two posts ago I said three possibilties...SFL->GOM; EC FL into GA, and Turn to north. I wanted to try to narrow it down, and that was the elimination of the GOM & north theories...not at ALL saying no to anything yet...that's what's so frustrating. Still will stick by no gulf hit, but is that set in stone? NO WAY. This is going to drive us all NUTS for the next 24-48 hours. Right now, I'm looking for some experts like Rabbit & scottsvb to post...they will have more answers than I do. Is this what Stewart is saying? Models they were using to forecast the subtropical high had bad info, thus the model trends to the right. Now he's expecting a shift back to the west on the 00Z run. I don't like the two "disturbing" comments he made in both his 5pm and 11pm discussion. BTW...what time is 00Z in laymen's terms? Basically he said he is waiting for the new track to come out, but he is expecting to see the track west and south of the track now. Then he goes on to say Francis will emerge into the GOM and could be a threat in my general area which is Mobile, AL....no I do not share Rick's ideas...LOL...Anyone else see the possibility? The 00Z run contains correct data...the previous runs (apparently) contained data with heights that were on average 20 meters too low. I think they have a very good idea of where Frances "might" go, but now that they have realized the models were even slightly screwed up (it only takes a little) they don't trust anything (and they shouldn't). Just subtract 4 from Z time to get EDT (subtract 5 to get EST when we are not on daylight savings). So 00Z is 20 (24 - 4) or 8PM EDT. It depends on the model, but most come out within 2 - 4 hours of their "time". Some models used to be held back from the public for a few extra hours, not sure if they do that now or not. I just looked at the new track map on Orlando's Channel 9 and Polk County is back in the mix. Is Stewart saying that another shift to the south is possible to the track at 5am or was he talking about the current one? I'm thinking he's talking about the next track. Also...they just mentioned that Polk County could see winds 50-75mph w/16+" of rain. I take it those are sustained winds. If there was any good news out of that forecast, it was that we would be on the "good side" of the hurricane. I suppose that could change if the track changes more to the west again. Also mentioned that the NHC could do something unprecedented: issue hurricane warnings in the morning for what is now under hurricane watch areas. That would indicate to me that they are NOT looking for a turn to the north/north-west and they are not expecting Frances to come to a screeching halt as was mentioned earlier. Get out of there, dude! I've seen the SLOSH models for Merrit Island. I'll post them if I find them. Merritt Island wills disappear if Frances hits near there. You won't have time to evacuate by the time you figure that out. A sturdy house won't do you much good if it has five feet of water on top of it. Hey Phil, Sorry about my comments. I didnt see the point you were making. I now understand you were just trying to narrow down the track for the sake of all of us so we dont go crazy. I think this storm has already taken a high toll on alot of us, and its still 48-72 hours from landfall. This past month has been amazing huh? I can't speak for Mr. Stewart, but I think he is anticipating the 00Z runs to be further west (as am I) and that might necessitate a need to shift the track a little further west/south. Maybe it's the contrarian in me, but I am going with a farther north solution. The GFS has taken a beating of late, but now the ETA is much farther N. and E., and so were some of the other models, so now it needs to be seen whether or not bad data was entered. Bolstering this in my opinion, is that I think the stretching out of the storm is an indication it may be trying to turn. Every time a situation like this comes up, I think of Gilbert. It was supposed to turn between the Yucatan Pen. and recurve, but the monster created its own environment, and would not turn. How high is my confidence? It's looking up at my feet. Hank, thanks for the good post. I'm in Murrell's Inlet, S.C., about 15 miles S. of Myrtle Beach. Just how "out of the picture" is upper coastal S.C.? I think they are being cautious at this point because they don't know what the data correction is going to do to the models. What I read between the lines in Stewart's discussion is that it is possible that the model consenus will shift further south and west. If this shift is significant, they will have to go with Hurricane Warnings for areas that a few hours ago were thought to be on the left edge of the cone, or outside it, and are now in the middle of it. I have great respect for the folks at the NHC, and it is times like this that I am very glad I don't work there. The 00Z GFS is NOT out...it is coming out as we speak....as I answered above, the correct data is incorporated into the 00Z runs, which are running NOW. OMG sorry Jason,,,Talk about lack of sleep??? ?I been looking at the 12Z run, Jason Fire me and bring in Rick on a boat to replace me. LOL I need more sleep then work and rest of time analizing all the data I get and info from other, zzzz even my girlfriend got mad cause i wouldnt go to a movie. thru 36hrs so far,,same as 18Z run. It has this going 325dg. Why would anyone want to go to a movie with a major landfalling hurricane going on?? I am in Fort Lauderdale. Can anyone tell me what their opnion is if I leave in the early am tomorrow and drive up the to coast of NC, do you think I will be able to make it out of the state before this thing hits? I value all of your opions. Please help. Thanks. Changed the format of this map to include more streets, highways and cities. Also included approximate path of Charley for reference. I will update the Wind Field graphics with the next significant change in coordinates. Skeeto: Based on your map I think you live about a mile from our house. My husband is so mad at himself for not getting that generator. Can you pull it out over the water before it makes landfall to incorporate in Broward County? Slosh models for the Central FL Coast . Use these to make your decisions, but read the disclaimer first. These are models. Okay..watching Norcross live here talking different possibilities and advice. City had a real feel to it earlier while I was out. Wanted to get a few more things..went to local .99cents store that was open and busy. Couldn't pay me to go to Publix tonight. 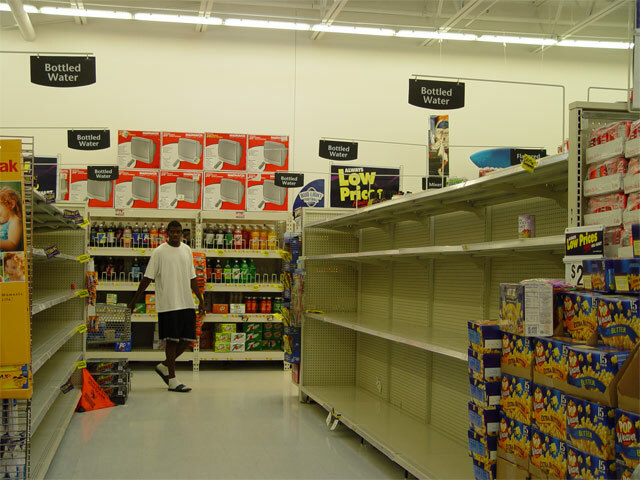 Heard shelves were partially empty and people looking lost roaming around wondering what to buy. Sharp contrast from the ones that were in their Tuesday morning when we were shopping holding lists in their hands. A few towering thunderheads .. bits of lightning and fast moving showers on a faster breeze. Packed gas stations. The feel of something happening in the air even before the word that maybe the high is stronger than the GFS and GFDL thought.. Think the track will be drawn down closer to WPB. Spent hours and hours looking over storm tracks today during slow times. Maybe WPB/Broward county line but dont think lower. Then again.. maybe I am in denial. Didn't post much today. In meetings at the library a few times to discuss storm and arrangements for tomorrow. City job.. And, busy doing things... but have enjoyed reading all your posts.. thanks..
What a great post. I was just looking at the SLOSH charts. Things don't look so good in Indialantic! i am of the strong opinion that many of the models are using historical data in conjunction with current recon....the historical data is likely causing the models to keep right of the possible westward track....Floyd, David, countless others....IDEAS REGARDING THIS THINKING? I am in fort lauderdale and scared to death. Do you think I have time to get out of the state now? We're building a house in South Lakeland on Crews Lake Drive. Probably be a stick pile by Labor Day though. she looks to be a cat 5! Well, maybe I should wait before I make any statement like that. Here, too. I went to Walgreen's tonight and the manager was just about pulling his hair out of his head. Publix is a nightmare, Walmart is sold out of water, batteries, etc. I often go with my gut feeling and let's just say the butterflies that were in my stomach have now morphed into pre-historic butterflies. Just an FYI for anyone interested. I live in Daytona Beach, so I couldn't pass up the opportunity to go down beachside and talk with Jim Cantore from TWC - who was reporting for a good 4 hours here tonight. He says they will be reporting from DB starting 7am .. then heading down to Vero Beach tomorrow afternoon. it's 20 hours straight through to New Orleans. In 10 hours you can be in GA. If i laughed it wasnt that it could briefly reach cat 5 status, but was that you wanted it to go to your house. IF, and I repeat IF a trend is developing in the forecast track since about 48 hours ago, it has mostlyl been S&W. This means to me that Polk County will be getting much more attention from Frances than before. Not saying a hit but going from an annoyance to duck occasionally...ok, maybe duck a whole bunch depending on how *far* left the trend might end up. I caution you and myself that a FORECAST is a ficticious thing...It hasn't happened and never will as it is in the future and when it stops being in the future, it is the present and no longer a FOREcast but a report of a historical occurance. By SUNDAY, we'll *all* know what the forecast *should* have been....for now, the apparant trend is more toward you there in POLK. Good luck!! and without construction on I-75 around Adel...urgh! >>> I am in fort lauderdale and scared to death. Do you think I have time to get out of the state now? God, and I don't invoke her name lightly, but what can one say? Those with much more experience please give an answer. My thoughts and prayers (Again) go out to all y'all. And if youre reading, whomever pointed it out. whether it's y'all or ya'll...whatever..get the hell out of harms way. So, if I'm reading Stewart's post correctly, the 0600Z advisory will be the intermediate advisory? Is he saying that they're going to update the track at 2am? and if so, Should we expect Hurricane watches and warnings to come out if they do? On a side note, I'm probably going to stay up to watch and see what they say about the Tampa area. As much as I worry about people on the east coast, I do have to start worrying about my own hide. On a side note, Was at Wal-Mart because a friend had to pick up stuff, and they had no water on the shelf. They were pulling more water out, and had placed A bunch of water on the floor for people to just pick up. I see 2, maybe 3 things that could account for the GFS forecast. The trough in New England is stronger on this model, therefore, it "pulls" it farther north, and I think the stretching on the sat pic is indicating that's where it would like to shift. There is a ULL in the E. Gulf, which is farther east than prior runs on the ETA. There is also a SW flow, albeit weak, in the Ohio Valley southward. Persistance forecasting would indicate the E. seaboard will be affected, as that seems to be the favorite track this year. Also, each storm has ended up further east than progged. I haven't followed this site much until now (sorry, forgot about it), but from a casual glance, it looks like the NOGAPS has been NOGOOD, the ETA needs time to pick things up, and the GFS has been better than the rest, but even it has been to far west at times. I still think this makes landfall farther north, and affects more of the east coast. I am in NJ, and I think it will be visiting here eventually in a much weakened state. Yep that new 0Z run of the GFS almost done now thru 120hrs and has almost exactly the same run as the 18Z., maybe just ever so slightly to the sw but that is due to it being slightly more sw at the start of the run due to the position compared to the 18Z run start. Overall same old same old. Not a weather guy. Sorry... no guesstimate on wind speeds for the 50 yard line at George Jenkins. Just want to contribute what I can. I bet someone here can assist though. On a good day with good weather and light traffic, I've made GA in less than 10 hours.... doesn't that red and blue 95 sign mean I can go 95? No? Oh.... but no ticket so far. But this will not be good weather and light traffic. If you leave in the early AM Thursday, you should be OK. Weather won't start until Thursday night, but I would guess that a lot of people are leaving right now, so traffic will be heavy. Still awfully new to Florida and still recovering from Charlie I'm extremly scared of what I can expect. Everyone told me with Charlie not to worry or evacuate becuase it was only a Cat 2 and not suppose to hit us direct... well we all know it ended up being a Cat 4 and pretty close to direct. What is the likelihood that Lee County/Cape Coral will get hit as bad again??? What winds should I expect??? Any advice would be greatly appreciated!!! It is looking like it's going more west. I just watched the graphic on TWC (you know, when the put the white line where the storm is?) and in the last couple frames it looked to be a tad south and west. A CREEPING solution along the coastline...somewhat further west that previously, so far, but basically has Frances taking up station off shore from MLB and just sitting there for 18 hrs with the collapse of steering currents. no you dont know where i am i was giving my opinion , i lived in miami in the 60;s ive been thru many hurricanes . you need to get a clue. This is one powerful bad girl...need to try to all come to a consensus on a landfall..and I need sleep! Lets let stuff go for now....Tomorrrow dawns and we're still where we were tonight. The 18Z GFS was almost identical to the 12Z. I have always given the GFS a lot of credit, but now I don't know. Of course I might be eating crow for a week if it turns out to be right. But I don't think so. This is Richisurfs from last year. I just lost my password and can't sign in and I also have new email address. I just wanted to tell you how great I think your site is doing...I mean staying up during this time when I'm sure there are tons of people on here. I have a cable connection which helps so much but I also have been keeping the page up and miniimizing it when I have to leave so that I don't run the risk of not being able to get it again. I keep hitting the ''refresh'' button and it automatically puts the new posts right up there for me. I feel this storm is going to show more of a southward track as time goes on but honestly I really know nothing...just a feeling from all the stuff I've been looking at and reading...i.e. the 11pm discussion from the NHC By the way,.Jason, I'm in Indialantic(beachside of Melbourne) and we will be evacuating to your area tomorrow morning but I'm not sure if we will have to turn right back around once this thing goes across Florida( if it does)wherever that might be. I totally think the NHC is on top of it but I do know they have a wide margin of error and anything can still happen. Anyhow, I wish it would turn up and go out so we could reap the benefits of good surf. I know though, I'm not going to be getting any this time but quite honestly, I could care less at this point. Thanks again ...it's running great Mike! Okay for those who haven't been watching the satellite loops the last few nights. From 0345Z to 0615Z; 1145pm EDT to 215am EDT the satellites are in an eclipse with the Sun and will not be updating the images. If you use loops during that period that storm will freeze at the 0345Z frame. Yep offshore about 75-100 miles giving coast hurricane gusts. Still almost same as 18Z. It will be interesting though to see what the NOGAPS and Ukmet solutions do. If they go more NE slightly, then they will come in better agreement. Over all GFS thru 84 is same. Wow! 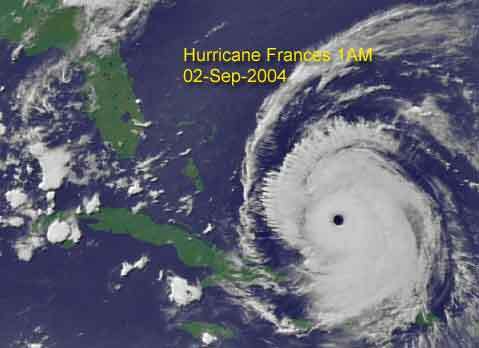 Do you realize that people from Miami northward along both the east and west coasts are expecting to be hit by Frances? The whole SE U.S. coast can't evacuate! As someone said earlier, make local preparations to secure your home, then get ready to go to a local shelter if and when the time comes. If you want to go on a long Labor Day weekend trip to, say Kansas(? ), leave now and enjoy yourself. You still have time to leave the state. Personally, I think it's too early to be forced to leave - voluntary evacuations along the coast are in order though. "Prepare for the worst, pray for the best." let's just hope they didn't blow it again and put in the same inputs as before, being an retired engineer , have seen that one done a few times. Hope not. With Charley, the NHC origionally thought he would move N and not move back over the water. They ended up changing that idea once it made landfall. I believe there's a strong chance this thing may enter the Gulf and cause more trouble. Let's hope not-but I'm not banking on it at all! In a word, Yes, I think so. Still a GA landfall very near Savannah...very interesting..I expected different. Mr Spock, good analysis on why the GFS is doing what it is doing..I just happen to disagree with what it is doing. I would say to her, "If they tell you to leave, GO!" Listen to whatever you're county officials tell you to do. Don't wait because the exact landfall area isn't set in stone, sweetie. Take some time tonight to get important papers together--especially your insurance information--pack up things you may want to take if you decide to leave the state. NHC IS BETTING ON A BIGTIME SLOW DONW...HOPE THEY KNOW SOMETHING MORE THAN ALL THE SITES AND DATA IN THE MODELS.....LATEST SPAGETTI IS IN FT. LAUDERDALE....KEEPS ON MOVING SOUTH AND WEST!!!! what do you think about this wv loop? Well, it is forecasting it to move faster than it was previously. 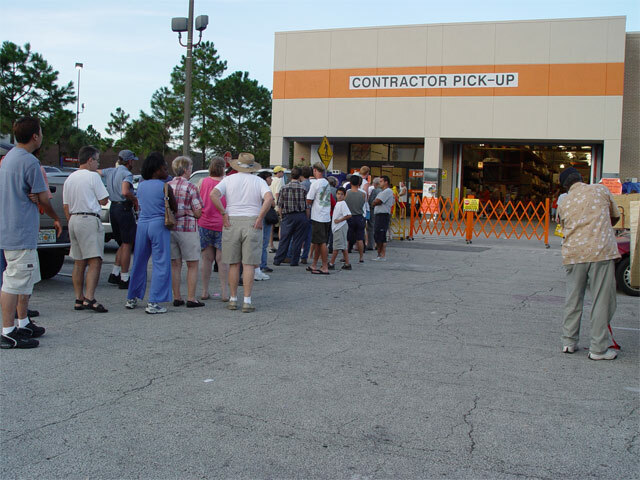 Going to be standing first in line tomorrow morning at 9am at Home Depot in Brandon to [hopefully] pick up Plylocks - all stores are sold out in Lakeland, and Brandon said they expect a shipment tonight for the morning; hopefully true, as this time around we're going to try and put up plywood on the two small windows, and pray on the glass doors (since complex won't let us put up nails, and there's nothing on the glass doors for the plylocks to "bite" into....). Think we're not going to dodge this one in western Polk this time. Repeating the Charley drill by bringing grandfather and mother out of their mobile homes to stay with us in the apartment. Hope everyone everywhere is safe and sound. I used to live in Ft. Lauderdale for 18 years, got real used to the drill of putting the metal panelling up and hunkering down. Now that I'm older, and hopefully wiser, if I was there and saw Frances heading in my general direction, I'd be considering leaving the area for safer ground. Even as it is, wife and I are dubiously watching Frances and a little uneasy in the apartment complex, but we're in it for the long haul. If Frances were on our side of the state, I doubt I'd be staying in the apartment. Still, it's nerve-wracking, and I'm trying to keep my mother and wife calm and not panicked. Take all precautions, make all arrangements, and do what needs to be done to make it through safe. Oh -- and don't wait for Friday to come to decide what to do. Better to be silly for having overreacted tomorrow than the be sorry for having not acted Friday night when the highways could be clogged solid. It certainly did change! Going all the way up to NC? Link for realtime Current Traffic Counts in FL. TurnPike in Osceola County is Already near Double the historical vehicle count. Nogaps coming in thru 60 hours,,still same with landfall near WPB in 60 hours. GFS 12 hrs positioning might be off. Will know by morning. I feel GFS 6z though will be more w and then the 12Z might get inline with NOGAPS. Still waiting for Ukmet. StormHound -- actually, the FSU Superensemble is nothing more than a least squares method of finding the biases in each of the member models (GFS, NOGAPS, etc) and determining a track forecast based off of the expected least errors in each of the tracks. A least squares fit isn't exactly an average, but it's a means of getting a weighted average sort of thing. There is no special data that goes into it that doesn't go into the other models; that's what makes the left bias it has exhibited for several days now so striking, in that it picked up on the tendencies of the models to the point that any leftward shift in those tracks will send the Superensemble a bit further left as well. That graphic on the front page about the crossing tracks is very telling. You see where they intersect? That's directly over my place in Orlando. Reports from that region say that items are at a high premium even now, particularly at Wal-Mart where they can't even get things onto the shelf before people take it out. To clarify a point about the poor initializations of the GFS/GFDL models...the 00Z runs will have that new data into them, but it's still up to the models to initialize it correctly. It may well assign a minimal weight to that data and go with something lower anyway -- that's what they have been doing. It shows why you cannot rely on the models solely and must use meteorological intuition -- several here have noticed the greater strength of the ridge and kept it on a more westerly/southerly track. Unfortunately, the NHC is very much tied to the models these days; it's partially the trend in forecasting and partially political/governmental pressure. But, the past two discussions have been very nice departures from a straight-up model discussion, and I would not be shocked to see the 5a track shifted further west...and a much slower weakening of the storm over land. It'll be moving fast and will take a decent amount of time to spin down; I think 40mph near Gainesville is severely underestimating things. Max Mayfield showed and compared the sizes of Charley and Frances on our 11 pm news. Frances is 4-5 times bigger than Charley in total size. WOW!!!!! This big storm may rake the whole state and slow down considerably. Hurricane Andrew's dollar damage record could be in serious trouble. I have now added a link to my own personal backyard weather station here in Boynton Beach. Hopefully my power will remain on as long as possible so that it can report for you all. If the power does fail, I will be personally calling LI Phil to relay my wind speeds, rainfall and pressure readings for him to post. Staying in an apartment until the house is done. The secret lab is in a vault off site (of course). These apartments seem nice. About a year old. Hope the building inspector was on his game! To quote LI Phil. "Don't bet or wish for things...they might come true". Or something along that line. Maybe it is an error magnified over time, but out to 126 hours, it is about to make landfall in southern N.C. There is also a very strong high to the north, so the windfield could be a little like Isabel. Even though I have been looking for it to hit farther north and east, this is almost too much for me to think is likely. That strong high and trough is really turning it on the GFS. At this point, with a couple of runs in a row showing this trend, it might soon need to be considered as an alternative. I'm confused now...is this what the models are saying or what you are saying? Are you expecting it to stall out and sit out there for 18 hours or are you thinking of landfall sooner rather than later? Sorry for all the dumb questions..just a lot of info being thrown out there that I don't understand. I work for a commercial ins. co here in alabama....we cannot write property policies as of today. We expect that when a system is in the GOM, but we are confused by this. Oh well...time will tell. Mr. Spock -- I'll concur with Jamie's reply a few posts up from here on his comments to your post. I jut don't agree with the GFS solution myself, either. What we are seeing over the east central US right now is called trough fracture. Essentially, three days ago, there was a very sharp trough located across the region, moving towards the subtropical ridge. However, the recurvature of Gaston and track of Frances served to enhance the ridge (in addition to an amplified pattern leading to ridge enhancement as well). You can see historically a number of cases where recurving tropical cyclones strengthen the ridge beneath them for some time. Now, that trough has split into two pieces, as it could not make it through the ridge. The northern portion is going the way of Gaston and making little or no southward progress. The southern portion, with a weak ULL in Alabama/Mississippi, is moving every so slowly northward around the periphery of the ridge as well. There is no further energy to drive into this ridge until the system in the Pacific NW makes it across the country...and it is at a fairly high latitude now as it is. A strong storm like Frances is going to gradually turn a bit to the north with time -- Coriolis and other dynamical effects say it will -- but I'm not sure I buy it slamming into the ridge and stalling like it has forecasted to date. What worries me is that the GFS has done the best of all models through yesterday with the 120hr forecast, with errors between 100-150mi. It'll either no longer be there in a few days, or it will have solidly beat the other models. Note about the Eta -- the storm only recently has entered it's grid domain (it only covers part of the Atlantic). It gets its boundary conditions (what is going on at the edge of the domain) from the GFS. Thus, until just the past couple of runs, it has been heavily influenced by the GFS model output -- as have a number of the other models. We'll see how long that lasts. Nogaps landfall near WPB or just N of there in 60 hrs then exiting near Sarasta in 84hrs. Moving wnw. I would agree more with this path and its showing the same ridging with the GFS. Lets see what the Ukmet shows for this run. Anyone have it yet cause I dont. That traffic site is particularly telling; if it's not exaggerating numbers somehow, there's anywhere from 3-5 TIMES the average historical traffic on most of the northbound east coast highways yesterday. People are definitely getting out, which I think is a good thing. I was afraid after Charley that some people, despite the obvious damage we could all see, would also take the attitude of "the NHC says it's coming right at us, so it's going to turn at the last second away from us", and stay put. I just did the math, and *if* it keeps up at it's current rate of speed, it will be just about 41 miles ese of WPB this time tomorrow night. Is the NHC still counting on a slowing forward motion? What time to the next models come out? Would someone mind explaining what this means to us people who can't figure any of this out? Colleen tomorrow night as in now Friday night, yeah possibly. I think they are coming out right now from what I can gather from Scott and Jason. A comment about Jim Cantore: he must read this board because at 9:30 he said, "I'm here in Daytona, but that does NOT MEAN that is where the storm is coming." Looking at the GFS initlializations of the 500mb pattern, I'm not sure it's got a full grasp on the strength of the ridge still. It has the overall pattern right, but the ridge is more than likely stronger in the west Atlantic than advertised (and stronger than it is in the east Atlantic). But, that's just my intuition. Evacuations -- follow the advice of your local emergency managers. The maps on FloridaDisaster.org (click on Public, then look for the mapping tools) are very useful in helping you make a decision as well, providing hurricane evacuation zones and storm surge zones (but note you have to zoom in pretty far to get them to display). A friend of mine has relatives in Melbourne. I think that will be on the northern edge of the storm, but the error potential is too great. My friend advised them to go to Naples, where other family lives, which isn't necessarily a bad idea. They should be far enough south there to miss the impacts of Frances -- and that far SW region of the state is probably the least likely part of any of the state to see major impacts from the storm, although they are by no means out of the woods yet. My family lives in Orlando, directly in the crosshairs of the current NHC path. They are stocking up and preparing much better than they did for Charley, but supplies are running low. They live in a spot that received a direct hit from Charley, but saw little damage due to good construction and a lack of trees and other objects to fall over. I only hope it stays south of them, as many around them were not as lucky. Even if the storm passes over them per the NHC path, though, they are best suited to ride it out or go to a shelter if the situation warrants. If you feel it best to leave the state, do so -- but be careful where you head. Depending on the track of the storm, it could impact anywhere from Montgomery, AL to Cape Hatteras, NC in some way, shape, or form. The catch-22 is that if you are going to leave, it is better to do it sooner rather than later as the roads will soon become clogged with traffic. Make contingency plans in case you leave and the storm comes your way anyway. Thought we might know more about the storm today -- and while we know a bit more, we still know very little. Hopefully Thursday will bring much more new information. As one last aside...the maximum potential intensity indicators over the SW Atlantic suggest 930-940mb pressure is about all that can occur. But, by no means is it a hard and fast guideline, and much work is being done to try to refine and improve this algorithm. It is something to keep in mind, however. Recon is enroute and I expect they'll find a slightly lower pressure, but nothing spectacularly lower. Frances does have a better appearance on the last satellite images before the nightly eclipse, and is in a favorable cycle for strengthening after the last eyewall replacement cycle, but by no means should we be expecting a cat 5 this morning out of the storm, if at all. Just my two cents. MikeG, I agree with the westward trend on the sat pics. If she crosses any part of the next island we'll know for sure. BTW-If you line up the first and last frame on the SSD loop. She will have to turn right to be north of Ft Lauderdale. Current sat puts crosshairs on the Mia/ FtLauderdale area, Without Any Changes in the current track. Bloodtar -- the important thing to get is that it is just the airplane's second ob on this flight (note the "FRANCES OB 02" at the bottom) and that they were at 20.4N & 69W at the time of the observation - or about 2 degrees further south and 3 degrees further east of the center of circulation (note the 50204 and 69010 readings in the 3rd and 4th groupings in the second line of code). They are heading there, but aren't there yet. Actual vortex fix is scheduled for near 6z, or 2a ET. Colleen -- I just did the math for that as well, assuming a position of 26 N and 80 W (a bit south and east of WPB). Frances is currently about 1013.45km from that location, or 628.34mi. At 14mph, it'd take the storm just under 45 hours to reach the coast, placing it near shore at about 8pm Friday night. Thankfully we have the extra time, however. This GFS run is much farther east at extended time periods (error magnification? ), that I think the next run is farther west. I just can't buy this storm making landfall near ILM, then passing just east of A.C. NJ. If that's the case, I'll see weather almost as bad as northern Fla.
Obviously, no one knows how the trough in New Eng. is going to play out, but as someone who hates cold weather, it seems like it has been here since 10-02 with only brief reprieves. Seems like I was defending the GFS's earlier solution, and now I am criticizing the very next run. Gotta love models. Man, I look at the stretch on the sat pic, and think it wants to turn towards the NW. And as for stalling, and then its next move, the next time that gets forecast accurately, might well be the first time. The recon observations you have been seeing here are "Mandantory Reporting Points". They have to report basic weather data every 30 minutes. It appears they are coming from St Croix, V.I., and like Clark said are tasked/ assigned to be in the center/eye at a certain time. The data you have been seeing is Not dropsonde data. Just basic location, wind, altitude, pressure and temperature/ dew point. A true dropsonde data reportis about 20 lines or more long. for what its worth, how about south florida to new orleans per the CMC... is that south and west enough, is that a worse case scenario.... I wonder if they will factor in this model run in their forecast? Does anyone think that were close to having a rare cat 5 cane ? Colleen it was rough math judging on the position Frances is going a true WNW (292'}at about 14mph over the last 8.5hrs.No deviation in her N movement at all or forward speed,at this rate landfall could happen Friday morning to early evening around the the tip of FL.This provided the track does not change or speed.To be frank at the moment cannot see either happening in the short term for sure. However you spell it, this is an incredible storm. Current sat pics are awesome, perfectly circular eye. Yea he said it had spectacular stadium effects AND he said the this looks to be a Floyd that very well will brush the coast, if it makes land its where it will make land. Did I hear this man right?? I am trying to finish packing, we are headed to Tampa, only place I could get reservations. I HOPE Frances does a Floyd, but I have been reading here and watching, learning. I think this beautiful monster is going to hit. I just hope anyone listening to TWC will not get what I got, admittly got with my head going in 5 directions. Lord I am tired. Survived: Mitch '98-Charley's crossing'04-Frances '04-Jeanne'04 Survived near fatal fear from Floyd's threat. Thanks, Clark and javlin. I'm watching Orlando News and I think they are on rerun because I've been hearing the same exact script for the last two hours. Probably getting some very much needed rest for what appears to be a wicked weekend. well I know that the CMC is not the most reliable model for tracking tropical systems, but at this point..... which was has for Frances.......now if in the morning the rest of them start showing a trend to the west and south... then the GOM looks like a real possibility..... if the ridge is strong enough it'll happen... I just don't know if it will be strong enough..
Latest model diagnostics are out. There are 2 key points here IMHO. First, they mention the 20m height issue, but I thought that was resolved for the 0Z models. I guess not. The second, is in their second to last paragraph when discussing the H5 trough in the N.E. The 2 words about that trough that I key on are "deeper" and "slower". I think he meant that it *could* deviate to the right or the left of the cone, meaning that it could brush the coast like Floyd. I'll listen and see what he says the next time. I'm not seeing a turn forecasted in the advisories that would indicate a brush, but maybe Mother Nature has other ideas, and I hope it is just a brush. I just read that and have no clue what that all means. Is that good or bad? Will the storm move faster or slower? I'm just a housewife, I don't understand all those weather terms. Interesting scenario Frank I still think she goes further S over Fl.The forward speed the ridge and open territory.No blocking mechanisms.The field is hers.The possibilty of another 48hrs with the ridge puts her past FL. Yeah, that Canadian model is pretty far south and west. I'm not sure how much I buy into it's solution, though. It historically hasn't been a great performer. By the way, I know they say the model data is updated faster at the FSU address, but you can sometimes get things faster from the original address, http://met.psu.edu/tropical/tcgengifs/. Plus, all of you all were slowing my machine down yesterday with the FSU address, so I'm kinda being selfish here! Time for some rest everyone...me thinks tomorrow's going to be a long day. Anyone have the 2am update yet? Advisory is late! What's up with the delay? The 2am isn't out quite yet...nor is there a recon fix. I think they are likely waiting for the recon fix, particularly on the intensity, to issue the 2am package. I'll comment on it very briefly once it comes out, then it's slumber time. this is not floyd. the conditions are totally diff. there was a deep trof. in the s.e. and they were pretty sure it would curve. there is no trof, here to do that. they need to talk about what is going on now not what was there in 1999.
when do sats come back? Me too, and they are late with the fix. Last report was an hour ago. Plenty time to do a Vortex and supplemental vortex. Thanks, for the update. I wonder what the plane really found. Since they upped the winds to 145mph. Intensity is up to 145mb, pressure 937mb (from recon). Nothing else of note that changed in this advisory, so I think it's safe to say that 5am will be the next stopping point along the road to landfall. Some or all of the hurricane watch along the FL coast may be upgraded to a warning in the morning, so residents need to make every effort to rush their preparations to completion. This is a sign that the storm isn't slowing like they thought it might, as a warning typically means you are 24-36hrs away from a storm (or less). Do I get the prize ? MAX FL WIND 138 KT N QUAD 0538Z. The prize is a couple of hours sleep. strengthening storm comes over my head. I agree with you. The NHC graphics are totally off the raw data coming in. What's up with that? For some reason they seemed to have taken a bit longer to do the fix tonite. Line "J" Is the temperature inside the eye. It's risen 5 C since the last fix. 23C versus 18C earlier. Must be over warmer water now. Not Good at all! Satellites should be back up in the next 15-30 minutes. I actually started to say that in my message and then realized I really didn't know if that was accurate, so I didn't say anything. Thanks for the info. so in 5-6 hrs only 2mb drop? (1) it ain't slowing down as of right now. What I'm afraid of is that if it does slow down, it will do so over land. (2) It will more than likely be upgraded at 5am (or maybe 8) because at the rate it's going, someone will be feeling hurricane conditions within 24 hours of 5am Friday morning. I'm dreading the 5am update...won't be surprised with the winds, but the track is what's go me concerned. If it comes in further south, it may be able to go across Lake Okechobee, which would do absolutely nothing to bring down the winds, and that would not be a very good thing. For anyone. Has anyone noticed the new UKMET model output? Very interesting! Can you post a link to that UKMET model? Thanks! The models appeared to have shifted further for Frances to go further south (Palm Beach County impact) or ride the coast to the Carolinas (Like Joe Bastardi support(s)/(ed)) The UK model has it entering around Cocoa and into Gainesville. BAMM 2AM update has Frances hugging the coast and on to the Carolinas-it's only a model. Ukmet doesnt have it going in to coco and to Gainesville,,its further south simular to the CMC and NOGAPS and moving out near Tampa. Eyeballing it from 0015 to 0615Z seems to have an extrapolation of about 25N and 78 or so west There seems to be a slight northern stair step in the 2 hour eclipse... but again, won't know if maybe, just maybe, it'll twist north. It'll take a few more frames to see if there's a slowdown, but in the meantime, Gonna get some rest... I suspect Tomorrow will be a... distracted day at work... heh. *IF*(and only if) it continues it's current course and heading, it's 39Hours from Landfall At West Palm Beach.. 5PM Friday??? The last update was 8PM on 09/01,,right? That is what I'm looking at. If you go to the GOES Storm Floater, click on the "Forecast Points" box on the top right hand side. It's almost exactly at where they have the symbol, so I think it's on track. Dave on TWC just gave the best explanation of what the heck is going on with that sub-tropical ridge, and he's leaning towards a stronger ridge, not a weakening ridge. Now I FINALLY understand what the heck is steering it. Thanks, Dave the Weather Guy! *EMERGENCY MANAGEMENT OFFICIALS IN PALM BEACH COUNTY HAVE ORDERED MANDATORY EVACUATION OF PERSONS IN THE CATEGORY 4 EVACUATION ZONE BEGINNING 2 PM THURSDAY. ANTICIPATE A MANDATORY EVACUATION OF PEOPLE LIVING IN MOBILE HOMES IN NORTHEAST GLADES COUNTY THURSDAY AFTERNOON. *BROWARD COUNTY EMERGENCY MANAGEMENT ANTICIPATES A MANDATORY EVACUATION THURSDAY FOR PERSONS LIVING IN PLAN A EVACUATION ZONE WHICH INCLUDES THE BARRIER ISLANDS AND ALL MOBILE HOMES. ANTICIPATE CLOSING SCHOOLS ON THURSDAY AND FRIDAY AND WILL LOCK DOWN THE FORT DENAUD BRIDGE ONCE TROPICAL STORM FORCE WINDS REACH THE AREA. **ADDITIONALLY...ALL SCHOOLS ARE CLOSED FOR PALM BEACH...BROWARD...AND MIAMI DADE COUNTIES THURSDAY AND FRIDAY. Pressure dropped 1mb. Now at 936mb. Eye diameter down to 25nm. Earlier pressure was 937, with a 30nm eye. AT 5 AM EDT...0900Z...THE HURRICANE WATCH IS EXTENDED SOUTHWARD ALONG THE FLORIDA EAST COAST TO CRAIG KEY. NOW IN EFFECT FOR THE FLORIDA EAST COAST FROM CRAIG KEY NORTHWARD TO FLAGLER BEACH...INCLUDING LAKE OKEECHOBEE. Still moving W or WNW? I wonder if the ridge will continue it on this path. Miami Dade/Broward are already on alert (part of the hurricane watch area). When was it projected to start its NW turn? Still moving WNW, maybe a tad more to the right than earlier. Anxiously awaiting 5AM update here in Port St. Lucie. It is going to be another busy day of getting ready. I think those waiting to give their forecast till it is only 72 hours out had better check the official forecast. I expect Tropical Storm conditions to begin Friday afternoon somewhere on Florida coast. The 5AM update is out already; the track shifted to the west somewhat-don;t know the landfall destination-appears to be Martin County. 5AM the track shifts west. Port Saint Lucie/White City/Fort Pierce/Vero will be in the NE quadrant-not exactly the best place to be-anyway, the track will continue to shift as the day progresses and perhaps the High pressure system above us may already be playing a role in Frances' journey. How does the west shift effect the point of landfall if any? Could this storm still have the potential to slip into the Florida Straights or has it gained too much latitude already? Thanks, I just got in ahead of the explanation. Next Question: Is this a stair Step wobble or is this shift consider definitive? Still watching here in Sebastian, too...the 5 a.m. advisories didn't do much to help me make up my mind to evac or not. Spent most all day yeaterday calling for motels in GA - not ONE available! Finally found one in Enterprise, AL - NW of Dothan. But with so many from the south alreading evacuating...afraid of getting caught on the road or out of gas, with the size of this storm. Our house is frame on concrete construction and is boarded up good and we are about 6 miles inland...I feel like a "deer in the headlights," LOL! My sister in Ft. Pierce feels the same way...I have heard that evac routes are clogged...does anyone know what the road situation is? I can only say that anyone along most of east coast who is considering leaving should not wait but just do it now. I will drive over and take a look at the Turnpike. It is only a little more than a mile west of me. Yesterday morning at 615am we drove over it to buy supplies at Walmart and The Home Depot parking lot was mostly filled. I need to fill a couple cans with gas and this might be a good time of day to do it. Still tryin to reason with Hurricane Season. Up here in Polk County, the condo owners were headed out to the barrier islands to board up their time share properties. I would imagine that would be the same down there as well, with some heavy traffic both ways. I saw loaded SUV's with Northern Tags loaded up at Gas stations yesterday morning at the gas pumps. A lot of New York state tags etc. I work for a major airline and just took a look at our booking levels for today. We have a total of...9 seats available from *all* Florida cities to anywhere else today. We also have a whole bunch of FEMA charters going on in and out of Florida today. I don't know if Dothan/ Enterprise would be a good place. The 72 hr forecast was just east of Tallahassee. You would probably be in a flood watch area. I'm in MS, and I don't know if we are in the clear, in respect to the latest shift. Here is a link I posted earlier for traffic conditions statewide. Thanks for all the responses...and, danielw, I think you are absolutely right about the Alabama situation...was looking at it on the map, and doesn't look good with the track right now headed in that area. Starting to think the best thing to do is hunker down and pray for the best...being disabled, I would have a hard time making that trip anyway. One more question...does anyone know if the dike around Lake Okeechobee will hold in possible Cat 4 winds?? Myfather-in-law, daughter and other family are there. Daughter lives right ON the lake, and she figures her mobile home that we gave her is a goner for sure...but the shelter there is not too far from the dike, about 2 miles. Need to get hubby up, give him coffee and scoot him out to the stores as soon as they open...heard they got shipments overnight. As for me...I am glued between the TV and this forum, LOL! Pressure has risen to 939mb, up 3mb from last fix. Eye is now down to 23nm, it was 25 on the last pass. Based on 0855Z/ 0455 EDT recon fix. Looks like a ULL is starting to wrap SW in front of Frances. Last couple of frames have a northward component, but it might be just a wobble. STORM TIDE INSIDE HOOVER DIKE WOULD THEREFORE BE ABOUT 24 FEET ABOVE MEAN SEA LEVEL ON THE WEST AND SOUTH SIDES OF THE LAKE. THE HOOVER DIKE PROTECTS INHABITED AREAS TO AT LEAST 30 FEET ABOVE MEAN SEA LEVEL. RITTA...KREAMER AND TORRY ISLANDS WOULD BE FLOODED AT THESE LEVELS INCLUDING SOME CAMPGROUNDS AND ROADS. THE EXACT IMPACT ON THE LAKE STILL DEPENDS ON HOW CLOSE AND FROM WHAT DIRECTION Frances APPROACHES THE LAKE. I have been watching posts for days. I am in Ft. Laud. Can you tell me what I am in for with a direct hit from this storm? Do you think any of hte houses that were built pre-Andrew can make it through this? The pressure inside the storm came up. That's good, by most standards. The lower the pressure falls, the higher the wind blows, and the more damage it does. The pressure doesn't have to fall for the wind speed to increase. But that's usually the case. After a storm makes landfall the winds die down and the pressure rises back to normal or standard pressure. Standard pressure is 1013mb or 29.92 inches. They are in different units of measurement. Danielw...thanks a million...this eases our minds ALOT!! Bless you for your help! I haven't looked at the exact new track. Find the Surge Models or levels for your county, then look at the area you live in. If it says you need to go, grab some things and go. Do Not Wait if you live in an area that is low, has been ordered or suggested to evacuate. Ask your neighbors, especially the long timers, how the area held up during Andrew. If they want to stay let them, but if you even think you need to go. Get Out Right Then. The roads will become clogged, the bridges will be out of service and you Will be riding the storm out in a car. If your significant other says they want to go. Leave right then and go with them! Thanks a lot danielw. What will be the wind speed when Frances hits Orlando? The shelters are only guaranteed up to a CAT 3 after that, its anybody's guess. I got this straight from the horse's mouth. thinking we were at when we created them"
I would like to say thanks to all here.. the info I have found here is quite excellent. My question is this.... I am a newbie to FL and live in Clermont which is just west of the latest projected path. I live in a new single story home and was hoping someone could provide some input as to what I should expect and whether or not my family is safe in that part of the state......obviously if the path stays as stated. I realize we would be within the eye but I have no idea what that entails!!! Thanks in advance for any comments. Please recall, Andrew was a Category 5 storm. The shelters held up far better than most homes, particualry those in Country Walk, Goulds, Princeton, West Kendall, etc. No one died in a shelter, but at least 10 people died and many were seriously injured in their own homes. Friends of ours who lived in Prinecton escaped from their totally destroyed house to a county shelter when Andrew's eye was overhead. They noted that they felt very secure there and medical assistance was close at hand. After my esperience in Andrew, I continue to recommend shelters over geting caught in the storm while trying to escape as relatives of ours did. They were forced to turn back after the winds reached more than 100 mph. The storm will likely come in *somewhere* as a Cat IV storm. As you appear to be in or near Orlando, it is reasonable to expect that IF the storm comes in as IV and travels over LOW land and only for 50-80 miles, that it will remain strong, probably at least Cat III as it probably won't slow down much in that distance and distance from its' "food" source (the ocean). It is so large that even if it come in near VRB, its' low angle of entry will leave a lot of the storm offshore and 'feeding' at least some. So, assume a Cat III. Winds 111-130 mph (96-113 kt or 178-209 km/hr). Storm surge generally 9-12 ft above normal. Some structural damage to small residences and utility buildings with a minor amount of curtainwall failures. Damage to shrubbery and trees with foliage blown off trees and large trees blown down. Mobile homes and poorly constructed signs are destroyed. Low-lying escape routes are cut by rising water 3-5 hours before arrival of the center of the hurricane. Flooding near the coast destroys smaller structures with larger structures damaged by battering from floating debris. Terrain continuously lower than 5 ft above mean sea level may be flooded inland 8 miles (13 km) or more. Evacuation of low-lying residences with several blocks of the shoreline may be required. 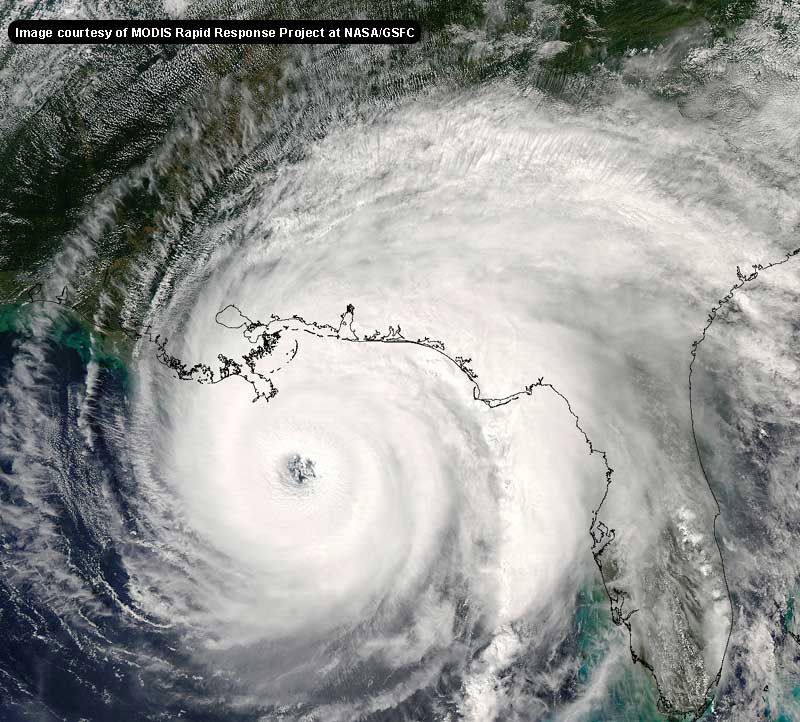 Hurricanes Roxanne of 1995 and Fran of 1996 were Category Three hurricanes at landfall on the Yucatan Peninsula of Mexico and in North Carolina, respectively. Winds 131-155 mph (114-135 kt or 210-249 km/hr). Storm surge generally 13-18 ft above normal. More extensive curtainwall failures with some complete roof structure failures on small residences. Shrubs, trees, and all signs are blown down. Complete destruction of mobile homes. Extensive damage to doors and windows. Low-lying escape routes may be cut by rising water 3-5 hours before arrival of the center of the hurricane. Major damage to lower floors of structures near the shore. Terrain lower than 10 ft above sea level may be flooded requiring massive evacuation of residential areas as far inland as 6 miles (10 km). Hurricane Luis of 1995 was a Category Four hurricane while moving over the Leeward Islands. Hurricanes Felix and Opal of 1995 also reached Category Four status at peak intensity. You can go to the NHC site for definitions of the rest of the categories. Less than Cat III *usually* does not cause structural damage to homes but shingles and tiles may be h istory, certainly trees are at risk and flying debris can be lethal if you are out in the storm and a piece of someones lawn furnerature hits you, or a tree limb, but *usually* it isn't considered a major disaster. With III-V, it is a major storm with significant damage to 'utter destruction' possible at the high end. For those in the Ft Laud / Tampa area, ON THE PRESENT FORECAST, you could see Cat I wind or just TS winds. so flooding is your main problem. Decide based on your elevation and dsaster plan reccomendations and govt official evacuation orders. 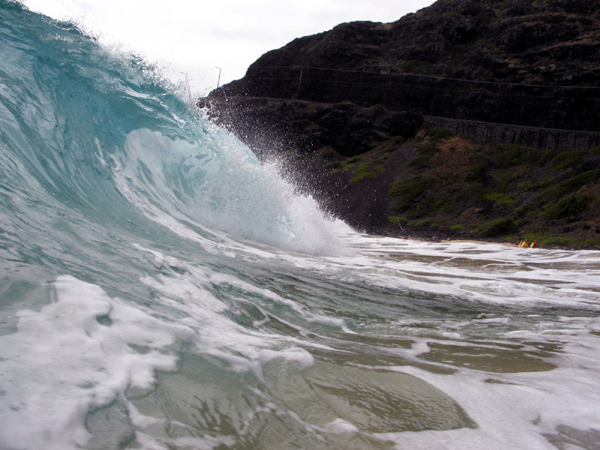 Water, more so than wind will be your problem. FORECASTS CHANGE and IF the storm goes well West & South, you may face stronger wind on the west coast, and conversely, if you live further East of the current forecast track, you may experience MORE wind and flooding. That is why it is important to KEEP INFORMED and ACT EARLY based upon current information, not speculation on what *might* happen IF some model says this or that *might* happen. Wishcasting kills people by giving often false hope that it will be better if you wait....Balderdash! If you choose the wrong model because the lines look nicer for you, you are putting your life at risk if you have *guessed* wrong. The OFFICIAL forecast is your best bet, even if wrong, they are the pros that do just this kind of educated guesses. We pay a lot of tax money to pay their salaries and we need to trust them to do their jobs. Yes, they are human, but they are well educated in *this* field...are you? If not, trust their judgement. Expect what they tell you and be relieved if it isn't as bad as forecast. While you have to make your own *informed* decisions, their forecasts are a best place to begin. Whatever you do, NOW is almost too late to do much changing of plans, that's why your need to prepare and ACT early.